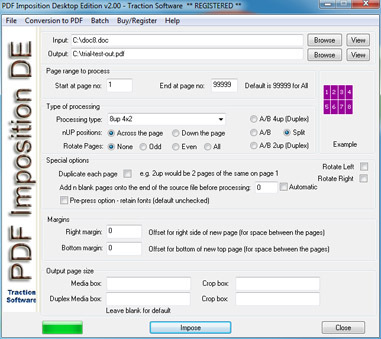 PDF IMPOSITION DE License Information THIS SOFTWARE IS SHAREWARE Written By Traction Software (copyright), Email: support@traction-software.co.uk "PDF IMPOSITION DE IS SUPPLIED AS IS. THE AUTHOR DISCLAIMS ALL WARRANTIES OF ANY KIND, EITHER EXPRESS OR IMPLIED, INCLUDING BUT NOT LIMITED TO THE IMPLIED WARRANTIES OF MERCHANTABILITY AND FITNESS FOR A PARTICULAR PURPOSE. IN NO EVENT SHALL THE AUTHOR BE LIABLE FOR ANY DAMAGES WHATSOEVER INCLUDING DIRECT, INDIRECT, INCIDENTAL, CONSEQUENTIAL, LOSS OF BUSINESS PROFITS OR SPECIAL DAMAGES, WHICH MAY RESULT FROM THE USE OF APPEND PDF EVEN IF THE AUTHOR HAS BEEN ADVISED OF THE POSSIBILITY OF SUCH DAMAGES." You are hereby licensed to: use the Shareware Version of the software indefinitely; give exact copies of the original Shareware version to anyone; and distribute the Shareware version of the software and documentation in its unmodified form via electronic means. There is no charge for any of the above unless you purchase the software for the amount stated in the purchase html which will allow you to use this software fully. 1 license is required per installation & platform. You are not allowed to distribute this software by itself or with other software without permission from Traction Software Ltd You are granted a limited license to use PDF IMPOSITION DE, to copy and distribute it as per the guidelines stated. PDF IMPOSITION DE License Information THIS SOFTWARE IS SHAREWARE Written By Traction Software (copyright), Email: support@traction-software.co.uk "PDF IMPOSITION DE IS SUPPLIED AS IS. THE AUTHOR DISCLAIMS ALL WARRANTIES OF ANY KIND, EITHER EXPRESS OR IMPLIED, INCLUDING BUT NOT LIMITED TO THE IMPLIED WARRANTIES OF MERCHANTABILITY AND FITNESS FOR A PARTICULAR PURPOSE.